While sailing in the Caribbean I found myself unhappy with the selection of skincare that I would find (especially when it came to trying to find non toxic sunscreen), however my frustration didn't stop at sunscreen. The salt water, heat, and humidity on my skin & body was a HUGE change and I quickly realized how important it is to come prepared, so the next time I went sailing around the Caribbean, I brought a few essentials with me. Sunscreen is extremely important for anyone who is prolonged sun exposure (especially for all the sailors & beach lovers out there who have an above average exposure time. ), I recommend the unscented eco-luxe Coola Sunscreen that is 30 SPF. However if you want more or less SPF don't worry as they offer SPF 50 & SPF 15 as well. This plant protection is a sunscreen that I first bought in Key West when I realized that I had forgotten sunscreen, and I can tell you that the quality and performance have turned it into a staple in my life! Another essential when surrounded by water and salt (aka the ocean) is a hydrating body butter to keep your skin from getting to dry. My personal favorite for this is the Lavender Body Butter from Oy-L, not only is it paraben free however it is also 100% natural with an ingredient list of hemp seed oil, hemp seed butter, shea nut oil, meadowfoam seed oil, avocado oil, jojoba oil, essential oils, vitamin E, and arrowroot. Another downside of the ocean when it comes to your overall beauty, is how much the ocean dries out your hair and leaves in brittle. One of the most hydrating shampoo and conditioners that I have ever found, is this tea infused Hydrating Ritual Duo from Pai-Shau. Tea is incredibly rich in natural polyphenols, vitamin C and E, which offer incredible amounts of anti-oxidants and anti-inflammatory properties while also offering UV protection from the sun. I am super prone to dry skin (especially when around salt water and salt air), so when I get those eczema like patches on my skin I have found this Hemp Salve from Endoca to be the best. You can seriously tell from how worn the label is that this little product has traveled far and wide with me. The antioxidants that are found in CBD are uncomparable in my opinion, and seriously work when my skin acts up. I don't even need to explain why one might need a natural deodorant (THAT ACTUALLY WORKS) when in a sunny, hot & humid climate. Fat and The Moon has created my favorite one thus far, I love that its light when applying with fingertip, 100% natural with organic ingredients, doesn't have a strong 'hippy' smell,' and aluminum free. When sailing and island hopping, I have found it best to try and minimize getting my hair wet (as well as washing it), I know that this is hard but when possible dry shampoo can be your best friend. My go to for a natural choice is Captain Blankenship Mermaid Dry Shampoo, that has an organic arrowroot powder base that works wonders on keeping your hair fresh and oily free. 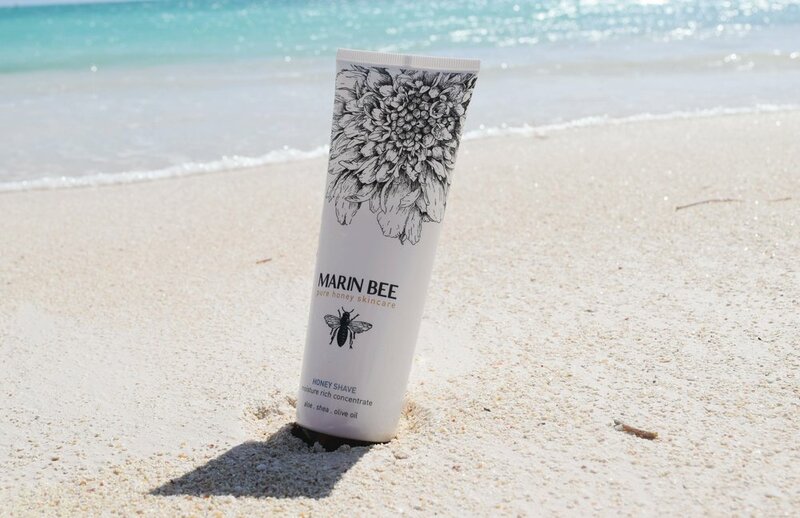 Being on the beach in sundresses and swimsuits means that you'll be shaving more often then normal, and because of this I always bring along my favorite shaving cream from Marin Bee. I honestly NEVER use shaving cream when I am at home in San Francisco, however something about the ocean water always leaves my skin more dry, and this honey shave cream keeps moisture in my skin (and smells delicious). Bonus is that the company Marin Bee is from the San Francisco Bay Area and 95% of the ingredients are natural or organic. From cleaning under my nails to cleaning my teeth, I always have a toothbrush with me. I absolutely hate (and feel so guilty) if I end up buying a plastic toothbrush, as I have read that it is estimated that 850 million plastic toothbrushes end up in landfills in the United States (I shudder to think of how many end up in landfills worldwide). My go to for bamboo toothbrushes are from Modest Planet, I love that they are made from 100% Mao bamboo that is biodegradable and compostable packaging. I never travel without a face mask as forgetting one and trying to find one that works and is natural is literally near impossible. One of my favorite ones that is also 'sea related' is the Thesis Seaweed Face Mask that focuses on blemished and problem skin. I have found that using this natural mask once a week helps my skin adjust and helps it stay calm and clear while the organic sea kelp & the organic spinach help to hydrate the skin. After a swim in the ocean a non toxic and clean body wash that gets the salt off, yet doesn't harm our precious ocean and kill the reefs is essential (especially if you plan to rinse off at the back of the boat, where your water directly goes into the ocean). One Made in the USA body wash that I have found (that is also worth a little splurge) is from the brand Paris Honoré, my favorite scent being mimosa. I barely wear perfume when sailing or in the tropics, however when I do I prefer something light with a faint smell that doesn't leave my skin irritated (unfortunately most perfume and fragrances are LOADED with toxic chemicals). I absolutely adore the Norwegian perfume brand Double You that was founded by Cathrine Røsseland in 2010 and inspired by traveling the world to a tropical island. The fragrance is Made in France and made from 100% natural ingredients and are based on Barnabe Fillion’s vision that the things he wants to put on his skin should be so pure that you can eat or drink them. While sand is a wonderful natural body scrub, this Mermaid Scrub from Ina Dayle is one of my favorite alternatives to the beach exfoliation. Sometimes I use this as an alternative to shaving cream (of course I rinse away the chunks so that the hydration from the oil is only left). As an added bonus to this scrub being 100% organic, with each purchase of an Ina Dayle skincare product they donate $1 to Lyme Disease Research. If your a minimalist and think I have listed WAYY to many products as 'essential' then I encourage you to pack just one thing that can work as a natural body moisturizer, personal lubricant, hand moisturizer, chapstick, shave cream, and sunscreen. Pretty much any coconut oil works (the one pictured above was picked up in Australia and no longer being produced). So I couldn't just share my favorite clean beauty products, I also just have to add in one of my favorite brands that is an amazing example of slow fashion and ethical luxury that is perfect for sailing as well as the tropics. Allow me to introduce you to eco lux Australian brand Alexandria Main. Our favorite thing about this brand is that 'The seamstresses who make Alexandria Main garments are empowered, not enslaved by their work'. All of Alexandria Main's garments are made by Fair Sew in Phnom Penh, Cambodia. Fair Sew is a full service transparent garment manufacturer that treats its employees fairly by providing them with a safe working environment, offers benefits far above the low wages that most garment workers in Cambodia receive and and is fair to the environment by minimizing wastage, using recycled fabrics (um HELLO #GreenFashion) when possible and avoids the use of toxic materials. So pretty much to sum this all up, Roxane Horton (the brilliant ethical designer behind Alexandria Main) has created the perfect example of how a brand can be both luxurious and have a conscious. Here at Florum Fashion Magazine we can personally not wait for the next collection from Roxane, which we hear will be a line of susatianable cruise caftans (can you think of anything more perfect for sailing in?). Disclosure: This is a sponsored post which Florum Fashion Magazine is proud to share with you because, sponsored or not, we only share stuff we love & stand behind.